Watching football from the stands or from the sofa – there are, of course, some fundamental differences. While your average SkySports-subscribing Joe will get a better overview of the match complete with instant replays and ‘expert commentary’, there are still aspects of going to the game that collectively outweigh any flashy TV wizardry. 1. Spain are a supremely impressive footballing force (as if you didn’t know). They may lack the momentary explosions of skill we see from the South Americans, but as a unit they’re currently untouchable. It’s not just all the ticcy-taccy passing movements, it’s also their no-nonsense, winning mentality. Even when Scotland got back to 2-2, you just knew the Spaniards wouldn’t settle for a draw against such modest competition – no matter how much we hoped that that was the end of it. Sure enough, they didn’t. For anyone accustomed to lower league Scottish football like me, watching Spain at their best was like going from cave paintings to Picasso in one step. 2. The atmosphere. 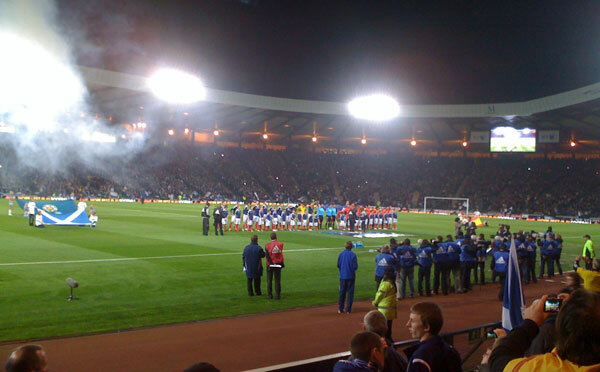 Actually, I was surprised by how subdued Hampden was for large chunks of the match. It was as if everyone was acutely aware of the gulf in class and constantly wary of where the next Spain goal might come from. But when the opportunities did arise, the Hampden Roar really was electric. 3. Seeing Andres Iniesta weave his magic, like, right over there. We had seats in the South Stand down near the pitch, and during the first half the world’s best midfielder was coming across to the left flank at every opportunity to torment the Scottish backline. The little fella who scored the winner in the World Cup final is typical of this current crop of Spanish footballers: ruthlessly efficient in possession and innately aware of the bigger picture as he attacks. Both he and Xabi Alonso in midfield were chief string-pullers on the night; David Villa showed glimpses of why he was the star of South Africa, but, somehow, Davie Weir kept him quiet. And the absence of Xavi and Fernando Torres was rarely felt. 4. The post-match pint round the corner from the stadium during which an anonymous Weegie explains what’s wrong with the current Scotland set-up, right down to the deficiencies of the youth scouting system (which probably stems from some personal feelings of injustice). That’s right, you don’t get that at home. Posted in Football. Tagged hampden, scotland, spain. Previous: Previous post: Bieber versus Bieber: so what if it’s a fraud? Next: Next post: Happy Burns Night!